John Haydon of Socialbrite has some great information for you to be truly successful using Google Plus business pages. These top 8 tips are taken directly from the article which also has some great information if you're wondering what the difference is between Facebook Pages and Google Plus. So definitely read the full article. 1Make it useful, compelling and memorable for visitors. Marc observes that many Google Plus users decide whether or not to put you in a circle based on your About section. 2It goes without saying that your main image on your Google Plus business page is what will create the first impression for visitors. So make it count. 3One thing that’s amazing about Google Plus Pages is that you can upload multiple photos for the main avatar. This creates sort of a photo flip-book like I did with the Inbound Zombie Google Plus Page (click on the main image to see this effect). Organizations can use this in a number of ways. For example, the Humane Society could upload a lot more cat pictures. 5Comment on those conversations as appropriate. Support other people’s agendas before your own. 6One of the best Google Plus features is Hangouts, where organizations can connect with fans, volunteers and donors in a video conference. 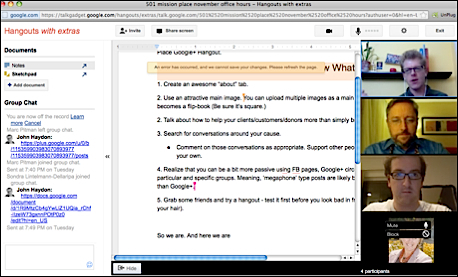 Hangouts allow for up to 10 people at a time and you can collaborate on shared documents or just have a casual chat. Read more tips about Hangouts from Nathan. 7It can get complicated, especially because Google has a habit of tossing new features out to users to see how they’ll respond. Below is the three of us writing this post live, real time, together. We ended up learning a lot from each other simply by doing stuff. 8Chris Brogan has written the definitive guide for businesses (and nonprofits) on using Google Plus: Google+ for Business: How Google’s Social Network Changes Everything. 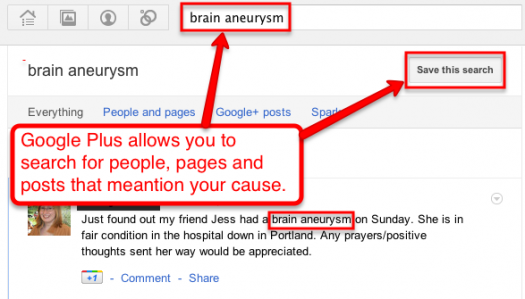 Share with us here in the Community how you feel about Google Plus business pages.